I had an interview for a job today. I haven’t had many before and despite the friendliness of the people who interviewed me, I found it nerve-wracking! I’m still feeling tense now, mainly because I have at least a day until I find out if I’ve got the job or not. I know it’s only a day but I hate that feeling of not knowing, of being in limbo until I find out. So seeing as that’s all I can think about at the moment, I thought I’d turn this nervousness into a (hopefully!) thoughtful Thursday’s Children blog entry on suffering from nerves and how that can affect how we write. In my experience, it can be useful to write when you’re feeling on edge. There’s nothing like a bit of escapism using your own imagination. It can distract you from whatever is making you nervous, giving you something else to focus on. And nerves can inform what we write; we may bring in a sense of strain into one of our characters’ lives. Perhaps they suffer a nervous breakdown that we wouldn’t have written into the plot if we hadn’t been feeling bad ourselves. Or maybe they find a way to break through the anxiety barrier and achieve something incredible against all the odds. It can be cathartic to write about our characters suffering from anxiety – we can shift some of our anxiety away from our minds into our work. It’s a little bit like artists painting their pain, both physical and mental. It can be like a channel flowing from the mind through the paintbrush or pen onto the paper. The artist Frida Kahlo was in a lot of pain for most of her life. She turned that pain into wonderful paintings which are visceral in their depiction of what it’s like to suffer from chronic pain. Because how do you show pain ordinarily when it can’t be seen? You can’t, you can only describe it. As a writer though, it is possible to describe it beautifully, especially when it’s pain of the mind. I digress a little, but what I’m trying to get at is that as writers it’s possible for us to transform our trials, our anxieties, even physical pain into something positive, a work of art that can be enjoyed by many people – even millions of people. If we work through the anxiety, the physical or mental pain, it can transform our writing and make it into something wonderfully unique. Everyone has their own story to tell. It can be tough to face our fears and actually write about anxiety, write about what scares us, but when we do we can find that our writing is the better for it. So if I don’t get that job, it’s too bad – but at least it’s given me even more ideas of what to write about. If you would like to join in the weekly bloghop that is Thursday’s Children, just write a blog post about whatever inspires your writing. 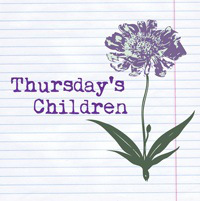 Then simply add your name to this link where you can also check out all the other wonderful Thursday’s Children bloggers. Thanks to Rhiann Wynn-Nolet and Kristina Perez for hosting. Well, let me be the first to wish you good luck – I hope you get that job! Interviews can be amazingly stressful, it’s true.I’ll never forget the “stress interview” I had once (where the interviewer deliberately attacked my credentials, belittled me, etc. to see how I’d react – except I didn’t realize that was his motivation, I just thought he was being an asshat…). Writing is after all escapism (for both reader and writer) so it’s the perfect antidote for calming nerves. I played Frida Kahlo in a play I did at university and she led a fascinating and somewhat tragic life – and yes, you can certainly see the pain she went through depicted in her paintings. You’re right Frida Kahloe was a hugely interesting person. Did you ever see the biopic of her staring Salma Hayek? A very good film. Unfortunately I didn’t get the job but I’ll keep trying and hopefully something else will come up. Posting this from sunny (yes really!) Wales. You’re right… sometimes we have to find a way to make ourselves feel like our characters do in order to write a good scene. Other times, those situations find us! Also, I liked your feeling of being in limbo. I feel like that’s something our readers feel (when they don’t have all the information) and one that our MCs no doubt feel too. What did you feel the day after the interview? Anticipation? Exhilaration? Frustration? Do I wish you good luck? Or break a leg? Or simply send hopes that you get that job? …. :( Oh, reading the comments I see you didn’t. Well, there are other jobs out there and maybe your experience today will make your current work-in-progress richer.